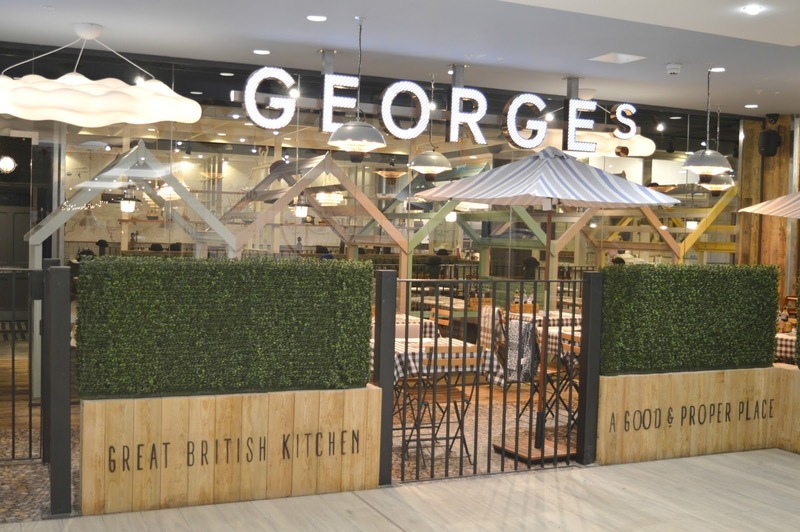 You may remember that when Grey's Quarter opened in Newcastle's Intu Eldon Square, George's Great British Kitchen was one of the first restaurants that I visited. Its fun decor, epic fish and chips and cotton candy cocktails have made it the talk of the Toon and I've been keen to return for a while. So when I was organising a catchup with my friend Sam and realised that she was yet to visit George's, a plan was made! The ultimate aim when you dine at George's Great British Kitchen is to get a seat at one of the beach huts. Named after local beaches, I may be a big kid, but I can't help wanting to get my bum into one of the huts and I know I'm not the only one! Luckily on our visit we managed to get ourselves a spot in "South Shields", our very own little North East coastal hideaway. 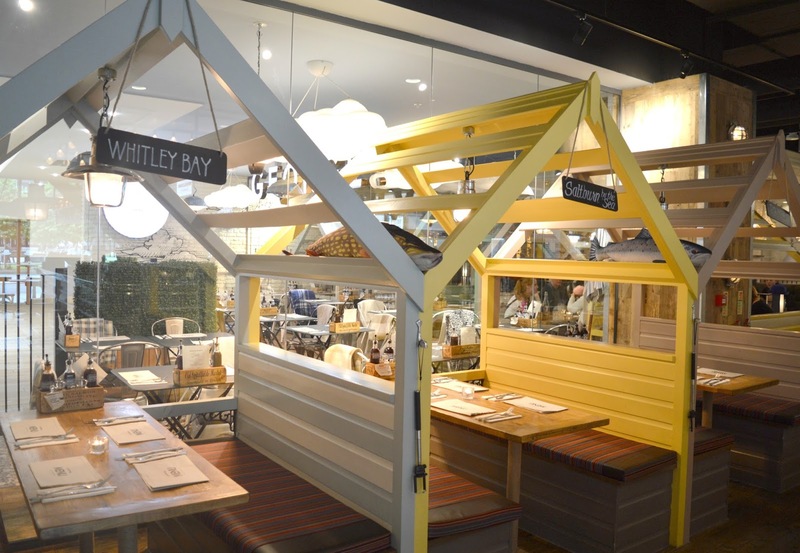 If the restaurant is quiet it's definitely worth asking for a beach hut booth! Of course once you've got over the thrill of sitting in your own beach hut, it's the rules that you then have to take at least one selfie with one of George's props. 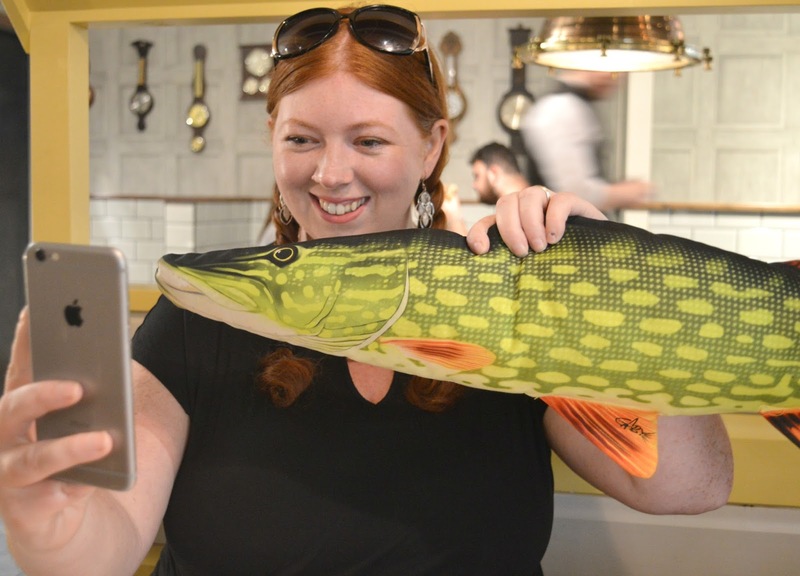 I think photographs of the colourful fish feature more on social media than the food. It's just too much fun to resist. Fishy photos over, our evening started with the all important study of the drinks menu. We both decided to indulge in a cocktail but with pages full of delicious sounding concoctions it was almost an impossible task. If, like us, you find it hard to focus on picking out a drink when there's so much choice then I must steer you in the direction of George's Great British Kitchen "Famous Five" - a carefully created drinks menu showing off their most popular cocktails. Perfect for the indecisive! I opted for the English Wild Garden (£8.50) - Brecon gin, creme de mure, apple juice and home made apple compot shaken together with rosemary and cucumber - doesn't that just sound like Summer in a glass? It was so refreshing and perfect for the hot days we've had recently. 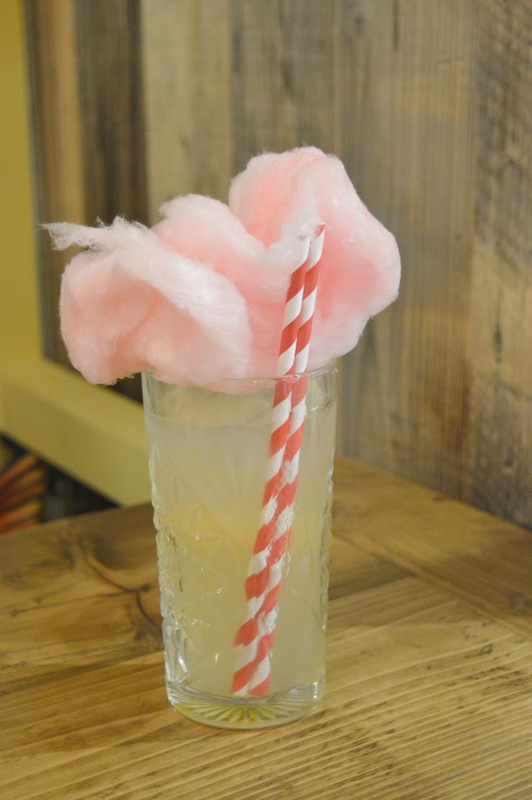 Sam opted for a drink that's been appearing all over Instagram since George's Great British Kitchen opened in Newcastle, the Candy Annie (£8.50) - vodka and gin mixed with George's passionfruit, lemon juice and George's own Rhubarb and Custard served with a small ball of candyfloss. Unfortunately Sam didn't take her eyes off her drink so I couldn't sneakily steal myself any but it looked delicious and I'm going to be ordering it for myself next time. 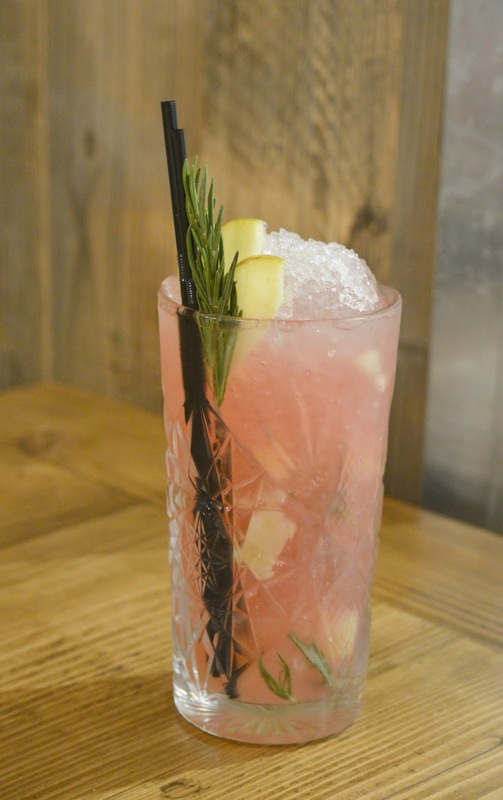 It's also worth noting that if cocktails aren't your thing there is also a huge gin menu at George's, perfect for creating your own post work tipple, as well as plenty of wines, beers and soft drinks. Truth be told, the drinks menu is a bit of a book! As I tried the famous fish and chips at George's on my last visit I decided to explore a different part of the menu this time. It has to be said there's far more to George's than the fish dishes that it's become so well known for. I focussed my attention on the "In The Bun" menu, packed full of naughty burgers that had my tummy growling. 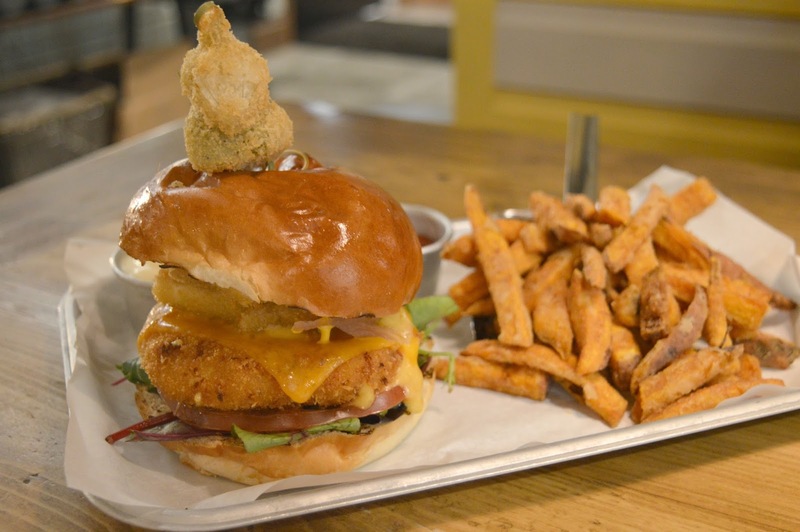 I've recently been having a real love affair with Mac n Cheese so decided to order the Mac n Cheese Fest Burger (£11.50) - a specially created burger made entirely of Mac n Cheese and French Mustard coated in British panko and served in a brioche bun stuffed full with lettuce, tomato, halloumi, red Leicester and dirty mayo. Served with my choice of sides (a shovel of Sweet Potato Fries for the lady please! 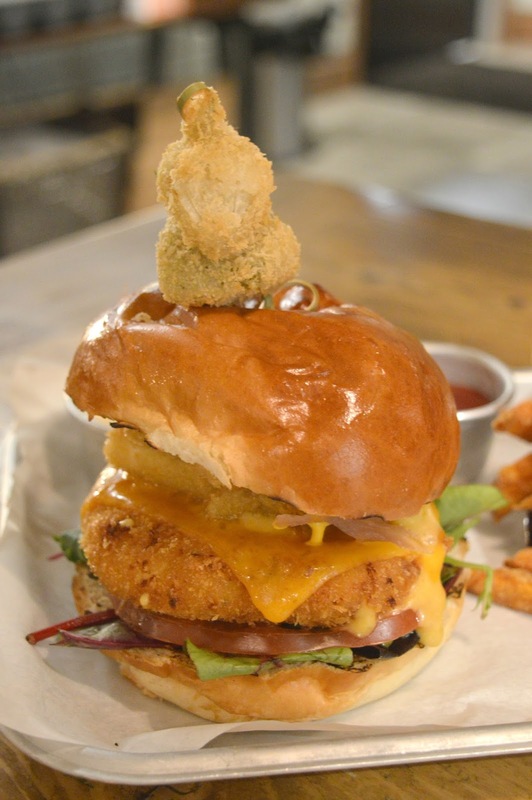 ), the Mac n Cheese Fest Burger fulfilled all of my cheese fantasies and then some. It was very naughty but worth every bite, no regrets from me when the burger is that epic. Sam decided to order from the Charcoal Grill where there were plenty of mix and match grilled fish and meat options to suit every taste. 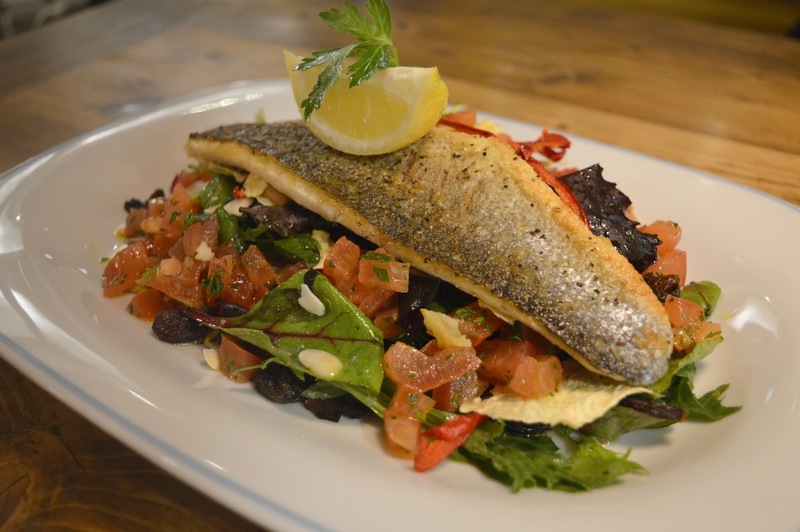 She opted for Charcoal Grilled Sea Bass served on Superfood Salad (£14.95) - mixed leaf salad, tomato salsa, beetroot chutney, bread and butter pickles, pickled raisins, toasted almonds dressed with Shropshire cold pressed rapeseed oil and lemon. I think she was feeling pretty smug about her healthier decision until she realised the dish came with twice cooked chips. She had meant to leave most of them but having covered them in George's Chipotle Vinegar she became hooked and couldn't resist eating the whole portion. After our main courses we were absolutely stuffed but we couldn't say no to the temptation of dessert and both ordered the Warm Cadbury's Fudge Finger Rolls (£5.95) - two Cadbury's fudge bars coated in panko breadcrumbs, deep fried and served with vanilla ice-cream, salted caramel and chocolate sauce. We were both a little disappointed by our desserts, they were a little on the chewy side and the middle wasn't as melted as I'd expected. 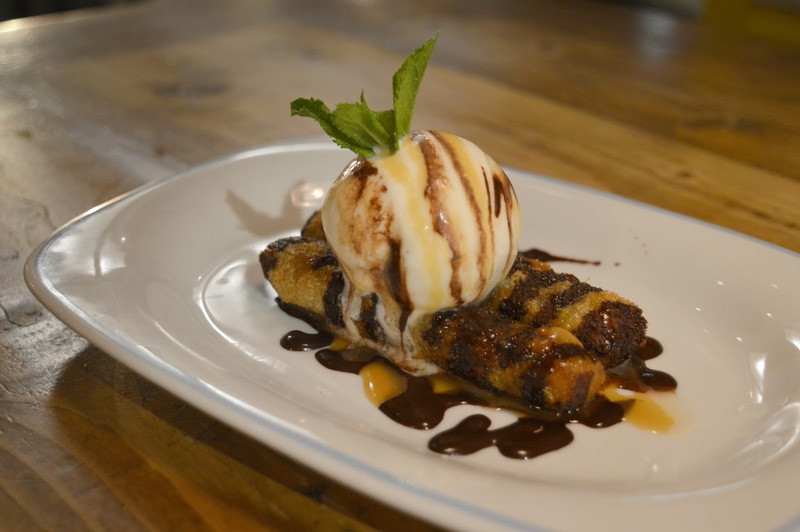 I much preferred the dessert that I had on my previous visit. My second visit to George's Great British Kitchen was fantastic and it has secured its place as one of the best new restaurants to open in Newcastle. I can't wait to go back again! Can you believe that on both visits I've been with friends and poor Simon hasn't got a look in yet? To read my previous review of George's Great British Kitchen (including their epic fish and chips!) head here. We were treated to a complimentary meal for two in exchange for this honest review. Yum! It all looks great. I've still not visited yet but I have been meaning too. Love the look of Sam's seabass dish. Never tried pickled raisins before! The English Wild Garden looks and sounds amazing! I love the fish finger sandwiches! We have a George's here in Nottingham and it's a lovely place, the decor is just the same too! I've had both the cocktails you and Sam had and they were delicious, but I've yet to try any of the deserts and by the sounds of the one you had I'm not sure I will anytime soon. Looks like a lovely evening all in all though!